Come on in -- we're glad you're here. rabble.ca was built on the efforts of progressive journalists, writers, artists and activists across the country. We launched rabble on April 18, 2001, just before the protests against the Summit of the Americas in Quebec City, and leapt onto the Net with the kind of coverage you could only get from the point of view of the rabble. Our Mission? "rabble.ca will draw on the real energy and power of the Internet -- passionate, engaged human beings. Blurring the line between readers and contributors, it will provide a needed space for issues, a place to explore political passions and an opportunity to expand ideas." We have covered events and issues in ways you'd be hard pressed to find anywhere else ever since. We now get 450,000 visitors monthly, and we are growing. rabble.ca features some of the best new and emerging progressive voices in Canada. You can read, hear and watch them in our original news, opinion, blogs, book, podcast and video sections and on our moderated discussion board! We also have issue pages that aggregate all kinds of coverage on topics such as labour, Indigenous, arts and culture, #Occupy, Gaza, the environment and many more. We also create special series pages on newsworthy topics, from elections to curated news features. Our in cahoots section showcases content and campaigns from our organizational partners. And our netted news feed takes you places you've never been before but have always wanted to go. 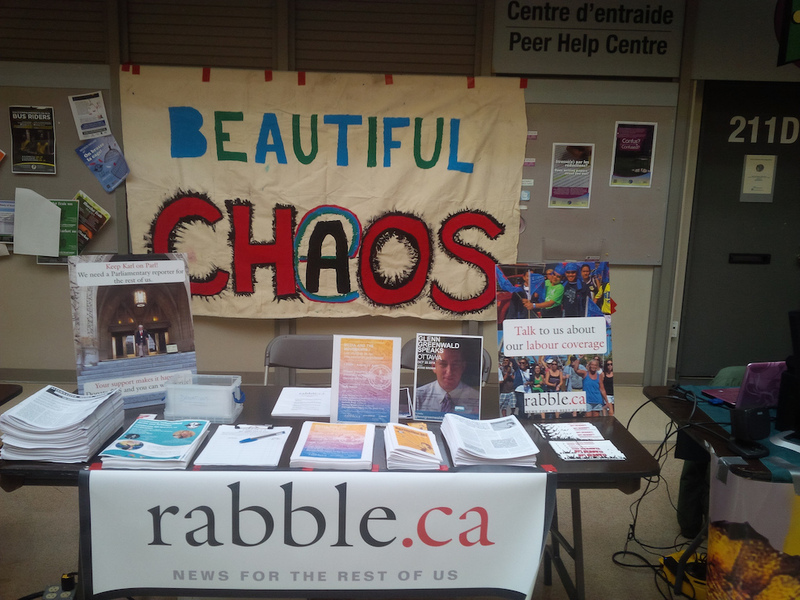 Our staff and our volunteers make rabble.ca run. Meet them in our bio section. But it's our readers who make rabble.ca thrive. Just check out our vibrant discussion forum -- babble -- to see what we mean. babble is an interactive space where rabble-rousers mix, mingle and mix it up, whether it's to comment on an article, post your own version of events, to follow breaking news or join in rule-breaking discussion. You can also use our what's up events listing to find or post events staged by social justice, arts and other organizations in your community, or across the country. Of course you can find rabble.ca on Facebook, Twitter, on your iPhone/iPad and, if you want, in your email inbox by signing up for our daily and weekly email highlights. rabble.ca is 100 per cent free to read, watch, listen, post and discuss the news of the day -- the "news for the rest of us."